The UK will hold a minute’s silence for the victims of the London terror attack on Tuesday, after thousands gathered for a vigil in the city on Monday. With flags flying at half mast, Britain will fall silent as clocks strike 11am (10.00 GMT) to remember the seven people killed and dozens injured in the central London attack on Saturday evening. While Londoners have declared their defiance in the face of terror, bunches of flowers piling up point to a city in mourning less than three months since five were killed outside the British parliament in another attack. On Monday evening, a kaleidoscope of London’s diversity turned out for a vigil near London’s Tower Bridge to honour the victims of the attack: Buddist monks in saffron robes, Christian clerics in purple cassocks and Ahmadiyya Muslims in black T-shirts bearing the words “I am a Muslim: Ask me anything”. Muslim men and women handed out posters bearing the words “Turn to Love” as suited office workers and spandex-clad gym-goers raised their smartphones to take photographs. 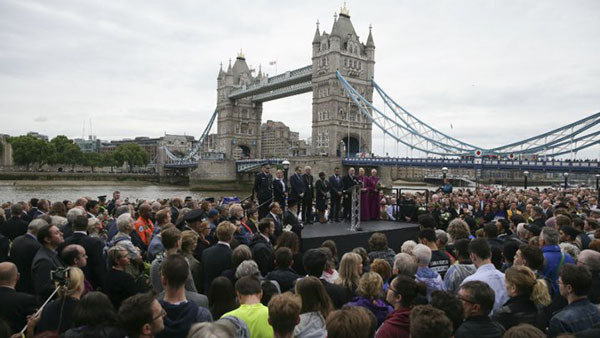 Mourners held up signs such as “Love for all, hatred for none” and “N.Ireland supports London”, as the British flag flew at half-mast on the bridge, a monument of national endurance. Sniffer dogs roamed the area before the brief vigil, and police, armed and unarmed, maintained a high-profile presence. A woman who gave her first name as Jemana, from a mosque in Northolt, north London, was among a group of colourfully dressed Muslim men and women carrying flowers. “We’ve decided to come from our mosque as a community, to say that none of this that has happened resonates with what we understand as Islam, and that we are very sorry for what has happened,” she said. London Mayor Sadiq Khan gave a short speech decrying the attackers who had brought carnage to the capital. “To the sick and evil extremists who commit these hideous crimes, we will defeat you. You will not win,” Mayor Sadiq Khan said to applause during the vigil. The loudest and most sustained applause came for police and emergency workers. It was followed by a minute’s silence. Less than a kilometre away, people stopped to look at dozens of bunches of flowers left at the southern end of London Bridge, which was cordoned off by police vehicles. “Like a phoenix, London will rise more beautiful and stronger. Hate will not win. Forever in our memories,” read a note written on Metropolitan Police Service memo paper, attached to a bouquet. A Frenchman killed in the attack worked at the bistro in Borough Market, French media reported. Georgina Lewis, 33, was accompanied by her two-year-old girl as she laid flowers. “It’s a way to say how sorry I am for the people that died, and also to make a promise to do whatever I can for my daughter so that these kind of things don’t happen again,” she said, tears flowing, as she looked at her child. Saturday’s attack, claimed by the Islamic State group, followed a similar car-and-knife assault by a lone attacker on Westminster Bridge on March 22 that killed five people and injured more than 50. In the northwestern English city of Manchester, 22 people died in a suicide bombing on May 22, and 116 were injured.